This feature gives users a chance to interact with their surroundings through their phone in a brand new way. And, of course, the different filters offer a realm of possibilities. Currently available are the “OMG,” “Cute,” “Gross,” “Love” and “Hello” floating words, along with the Smiling Rainbow, Crying Cloud, Kissy Faced Popsicle and Cheeky Coffee. According to The Verge, these filters will change daily. 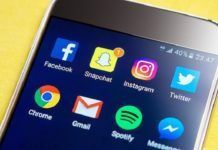 They’re totally movable around the screen, and as Mashable reports, it’s only a matter of time until Snapchat’s competitors, Instagram Stories and Facebook Camera, follow suit. Are you excited to try the new World Lens filters? Let us know in the comments below!